In 2012, Hurricane Sandy slammed into New Jersey, producing a major storm surge and damaging or destroying many thousands of homes. Over the years that followed, builders put up new houses and reconstructed damaged ones — in many areas that will be vulnerable to more flooding in the future. The post-Sandy rebuilding was a striking example of a broader pattern. Across the United States, coastal communities have recently built tens of thousands of houses in areas at risk of chronic future flooding driven by sea level rise from climate change. That has put homeowners, renters, and investors in danger of steep personal and financial losses in the years ahead. And while municipalities are increasingly developing plans to cope with sea level rise, the pattern of actual recent construction may be a more robust guide to which places are taking the threat most seriously. In what we believe to be the first country-wide analysis of its kind, Climate Central and Zillow have isolated the number of new homes in low-lying coastal areas in all 24 coastal states, projecting how many will become exposed to chronic ocean flooding over the coming decades — depending on what choices the world makes around greenhouse-gas pollution today. The results are clear. If the world makes moderate cuts to greenhouse-gas pollution — roughly in line with the Paris agreement on climate, whose targets the international community is not on track to meet — some 10,000 existing homes built after 2009 will be at risk of flooding at least once per year, on average, by 2050. The figures for 2100 are about three times higher — and five times higher if pollution grows unchecked. Over the last decade, public interest in sea level rise has grown, tidal flooding has increased in many coastal communities, and global attention has coalesced around the dangers of climate change in international negotiations in Copenhagen and Paris. And yet in the years after 2009, the percentage growth rate at which new homes were added inside of America’s highest coastal flood-risk zones outpaced the percentage growth rate outside of those areas — in more than half of the country’s coastal states. By boosting the average water height, sea level rise is projected to make the kinds of intermittent floods that coastal communities see once in the average year reach farther inland than they do today. Those floods can damage and devalue homes, degrade infrastructure, wash out beaches, and interrupt daily life. Future emissions will shape the extent of those harms — and the number of homes in each coastal region’s “risk zone” — in the years ahead. Unless otherwise noted, this report defines the risk zone as the area exposed to an average of at least one coastal flood per year in 2050, under the moderate emissions cuts known technically as Representative Concentration Pathway (RCP) 4.5, and under the median projections for sea-level rise corresponding to this emissions level as described in Kopp et al. 2017. Other risk zones can be defined with other assumptions, such as unchecked emissions, or by looking to the year 2100, and yield different results. “New homes” refers only to currently existing structures built after 2009 and before 2017 (or before 2016 in Alabama, Florida, Mississippi and New York). “New” does not refer to homes that will be built in the future. New homes in risk zones are not evenly distributed across the country’s coastal states. Local factors, from the size of the population and the condition of the economy to the amount of space available, shape the development of new housing stock in each community. And the size of a risk zone is itself the product of a variety of elements, from land elevation to the presence of protective features such as levees. Fairly comparing the pattern of new, risky construction across different cities, states or counties, then, requires tracking more than just raw numbers. One way to do this is to compare percentage growth in housing within the flood-risk zone with percentage growth outside of it, producing a single, comparable ratio for each place. Take the state of New Jersey. After 2009, the housing growth rate was more than three times higher in the coastal flood risk zone than in safer areas. Around 2,700 new homes, worth some $2.6 billion, were put up in the flood-risk zone after that year — most likely driven by reconstruction following Sandy. In Mississippi and Delaware, meanwhile, the ratio of risky growth to less risky growth was around 2.5. 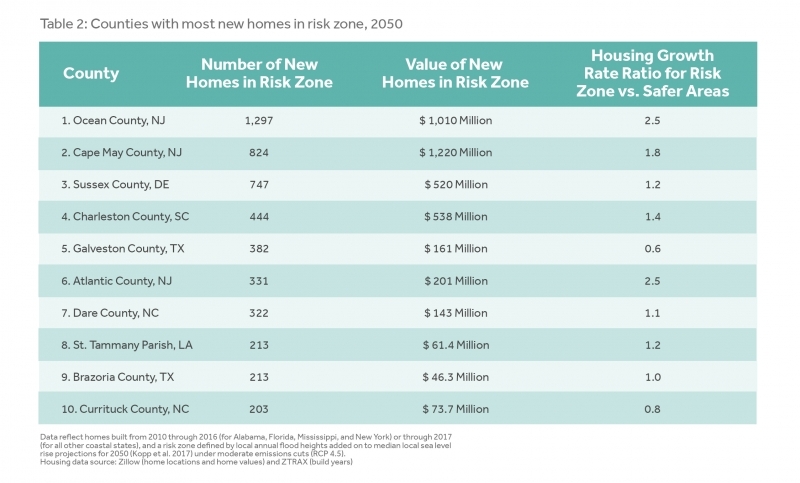 And in Florida, where the recent risk zone growth rate has just slightly outpaced the growth rate in safer areas, 908 newly built homes are nevertheless in locations at risk of flooding at least annually by 2050. Nine other coastal states likewise saw their construction growth rates in the risk zone outpace their growth rates in safer areas. (In addition to the states listed in Table 1, these include Alabama, Hawaii, Maine, New Hampshire, and Rhode Island.) More than half of the country’s coastal states, in other words, have recently seen higher housing growth rates inside the flood-risk zone than outside of it. 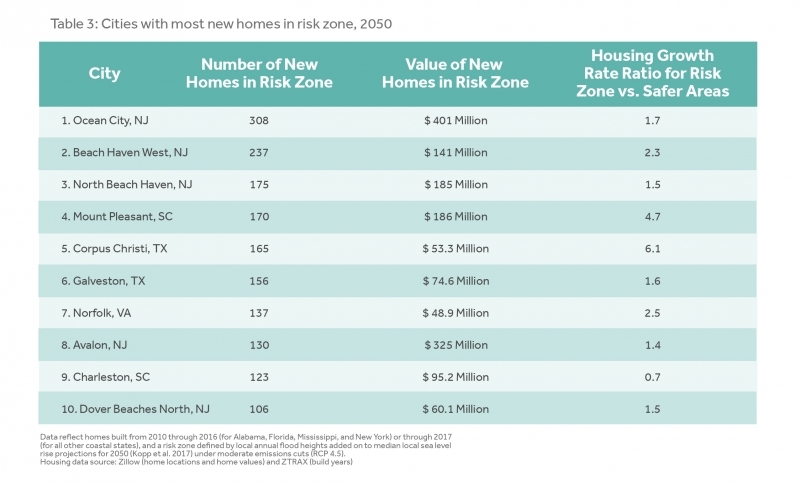 Just as the growth in new risk-zone housing is unevenly distributed across states, so it is unevenly distributed within them. There are 23 counties where more than 100 at-risk homes were built after 2009. All of those counties are in ten states: Connecticut, Delaware, Florida, Louisiana, Mississippi, North Carolina, New Jersey, South Carolina, Texas, and Virginia. In Ocean County, New Jersey, more homes — about 1,300 — were built in flood-risk zones after 2009 than in any coastal state except New Jersey itself. 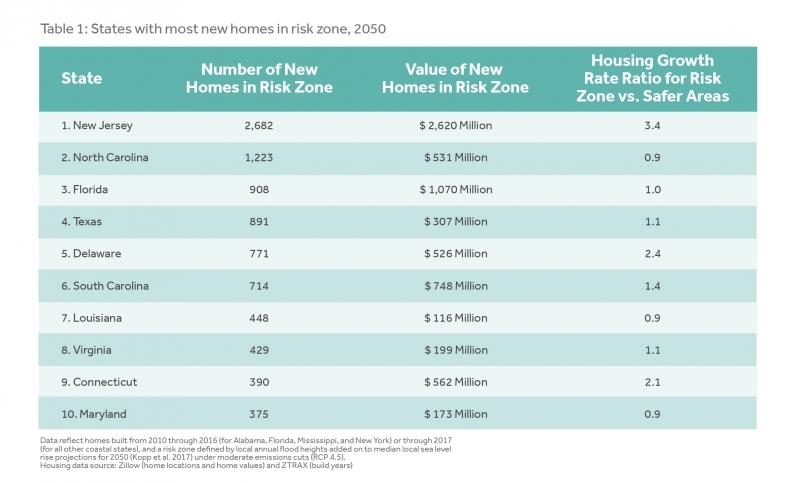 29 cities built at least 50 homes in the risk zone after 2009. None built more than Ocean City, New Jersey, a popular resort town in Cape May County, which put up 308 new houses in the risk zone. The larger cities of Corpus Christi, Texas, Charleston, South Carolina, and Norfolk, Virginia, also rank among the cities with the highest number of new homes in areas of future chronic flood risk. This report has so far focused on just one pollution scenario. But other outcomes are possible. Instead of making the kinds of moderate emissions reductions pledged in Paris, the world might achieve deep cuts. Alternatively, humanity could pour greenhouse gases into the atmosphere unchecked. How would these alternatives affect the coastal flood risk to recently built U.S. homes? By 2050, not by much. 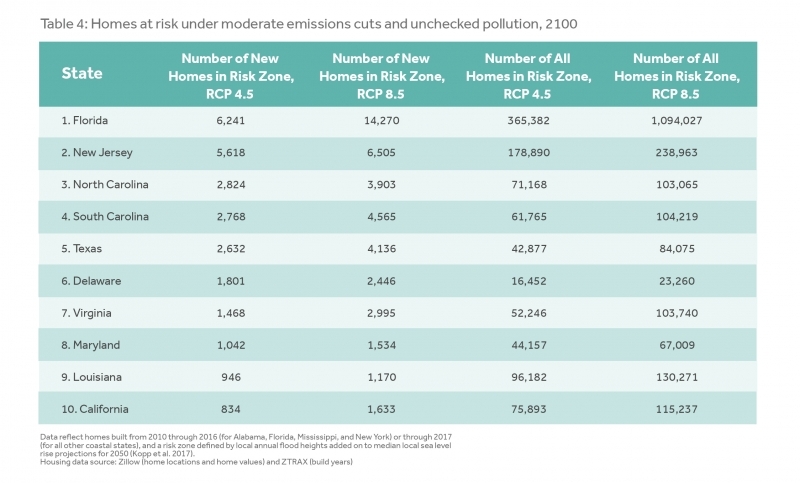 Moderate cuts to pollution would leave just over 10,000 new homes in the risk zone. Deep cuts in emissions — what the Intergovernmental Panel on Climate Change calls RCP 2.6 — would trim that figure to just under 10,000. And unchecked pollution, or RCP 8.5, would place a little more than 11,000 homes in areas in danger of at-least-yearly future floods. By the end of the century, however, there will be massive differences in the dangers that these emissions scenarios pose for coastal homes. Deep cuts would leave 18,000 recently built homes at risk. Moderate reductions akin to those pledged in the Paris agreement would boost that number to 30,000. If greenhouse-gas pollution rises unchecked, 49,000 of today’s new homes would lie in the flood-risk zone by century’s end. More striking still is that those 49,000 just-built homes would represent a tiny fraction of the total number of homes at flood risk. Unchecked pollution would put a total of 2.5 million existing homes at risk of yearly flooding or worse by 2100. Those properties are currently worth $1.33 trillion — an amount equal to six percent of the U.S. economy. No state has more to lose from such an outcome than Florida, where 8,000 more new homes are projected to be in the flood-risk zone by century’s end if greenhouse-gas pollution continues unabated than if moderate cuts are achieved. When all home vintages in the state are considered, the difference is even starker. Unchecked pollution would put 730,000 more homes in flood-risk zones than would moderate cuts — and 960,000 more than deep cuts. This analysis determines the maximum local land elevations that define risk zones by projecting future local sea levels and adding the height above sea level that local floods exceed on average once per year. Local sea level projections are based on a recent peer-reviewed research paper (Kopp et al. 2017) building off of global projections from the Intergovernmental Panel on Climate Change and emerging research on the potential instability of Antarctic ice sheets (DeConto and Pollard 2016), which could lead to significantly more sea level rise in the second half of the century. Climate pollution scenarios modeled include “unchecked pollution” (technically, Representative Concentration Pathway 8.5, or RCP 8.5), “moderate carbon cuts” (RCP 4.5), and “deep carbon cuts” (RCP 2.6), this last choice meaning a peak in emissions near the year 2020 followed by a sharp decline to zero near 2070 and then by net negative emissions. The sea level model was run for thousands of simulations given each scenario. Median projections under each scenario for the years 2050 and 2100 are used, reflecting mid-range sea level sensitivity to climate pollution. Lesser or more severe outcomes are possible, with 5th and 95th percentile results available in the Risk Finder tool (scroll to the “Future Flood Risk to Homes” section of the tool after typing a city, county, or state name, and click on the gear-shaped settings icon at the top right of the panel). Annual average flood levels were derived using methods from Tebaldi et al. 2012, with water level station data updated through the end of 2015 for 71 stations around the United States. This approach assumes no future changes in the frequency or severity of coastal storms or tides, as compared to past decades. Some research indicates climate change will worsen future storms. Storm surge associated with major hurricanes has already been increasing over the last century. “Risk zones” are first classified as areas with elevations below local projected sea levels plus annual flood heights. Assessment is based on accurate, high-resolution, lidar-derived elevation data provided principally by the National Atmospheric and Oceanic Administration (NOAA). Initial risk zones are then refined by removing low-lying areas that appear to be protected from the ocean by natural topography or by levees. This approach is called using a “bathtub model,” since it relies only on how still water would fill a landscape, like water filling a tub, without accounting for factors such as wind, waves, or rain that give actual floods dynamic and uneven surfaces. Bathtub models are perfectly appropriate for mapping pure sea level projections, and make reasonable approximations for mild floods, such as annual ones. Dynamics play a larger role in rarer and more violent storms, so bathtubs are less appropriate for these. More sophisticated methods using hydrodynamic simulations can take many factors into account that bathtub models cannot, but require large amounts of computing power to characterize well the thousands of combinations of sea level, tides, wind, waves, and rain that any location might experience in the future. Levees, walls, dams, or other features may protect some areas, especially at lower elevations. Data limitations, such as an incomplete inventory of levees and a lack of levee height data, make assessing the protection afforded by levees difficult. Levees are particularly prevalent in Louisiana and in the Bay Area and San Joaquin delta region of Northern California. Missing or mischaracterized levee data in these areas may have important effects on results, including known overestimates of exposure due to missing levee data in Northern California. We use data from the FEMA/USACE Midterm Levee Inventory for our national flood control structure dataset, and supplement this with local data from Louisiana and Massachusetts. This analysis does not account for future erosion, marsh migration, or construction. As is general best practice, local detail should be verified with a site visit. We assume levees are always high and strong enough for flood protection. However, the American Society of Civil Engineers rated only eight percent of levees as in “acceptable” condition, and some areas and assets that appear to be protected by levees, ridges, or other features may not actually be protected. Areas may have hidden connections through porous bedrock geology, as is common in South Florida, another area with plentiful levees that line drainage channels and canals. Low-lying areas may also be connected by channels, breaks in levees or seawalls, or drainage passages that are not captured by the elevation data, such as sewers. There is further no guarantee that existing levees will be maintained through 2050 or 2100. On the other hand, new defenses could also be built within these timeframes. Homes whose geographic coordinates lie within or outside of risk zones were separately counted and their values, which were estimated by Zillow, were summed. Zillow provided location, value data (Zestimates), and build years for homes built through 2016 (for Alabama, Florida, Mississippi, and New York) or 2017 (for all other coastal states). Separate tallies were made for homes built in 2010 or later, versus 2009 or earlier. The data do not include build year for some homes; these homes were included in analyses for all homes. Only homes with known build year were included in calculations of housing growth rate, which was computed as homes built in 2010 or later, divided by homes built in 2009 or earlier. Geographic coordinates of homes within the Zillow database may also contain errors, especially in low-density rural areas. However, we have empirically found such errors to be virtually random with nearly zero bias, so exposure totals aggregated to larger administrative boundaries, such as cities and counties, are expected to accurately reflect actual vulnerability. Zillow property and Zestimate data were refined to ensure a set of unique properties with complete addresses and home valuations (Zestimates). Zillow data include single-family homes, condominiums, and other homes in multi-unit properties, such as duplexes and triplexes — in other words, units where the tax parcel is a single dwelling unit. Buildings zoned for commercial residential use, such as apartment buildings, are not included, and so total housing counts using these data are generally lower than corresponding estimates using the 2010 census. Address and built year data were provided by Zillow through the Zillow Transaction and Assessment Dataset (ZTRAX). More information on accessing the data can be found at http://www.zillow.com/ztrax. Proprietary Zillow data, such as Zestimates, were provided under strict confidentiality.